Unofficially, we have 160 entries from 112 people. We should finalize everything by Saturday. You will notice three new menu items at the top. Standings – The current pool standings are updated by the next morning (usually late that same day though). Team Dist – Who did everyone pick to win it all? 18 teams were picked. How many picked Arizona to make the Final Four? All Picks – This is everyone’s picks sorted by champion. You can find out who were the 7 people who picked Buffalo to beat Arizona. Who is that one person who did not pick Xavier to make the Round of 32? Amazingly, for the first time ever in 24 years, we have two entries with the exact 63 picks (they differ on total points though). CryingJordans and AlfordBlows will be forever tied as we move through the tournament. Soon, the Nicknames will be up so you can see who is who in the pool. And Your Bracket has been up since Wednesday so you can print out your bracket if you forgot. We just hit another milestone (by 4 pm, or Hour 67), getting our 100th entry courtesy of Alex J’s third entry Jackson’s Picks 3. The earliest we have ever hit 100 was at 9 pm. With 100 entries, that is above the pace of our record year in 2016 when we had 74 at this time. We have received entries from 70 people, though only 8 are new players (welcome!). It might be that there is no consensus team to win the title but we have already had 10 people submit the maximum of three entries (record: 11 in 2015) while 10 have submitted two entries (record: 26 in 2015). Though I won’t discourage it (it increases the pot with these extra entries), but in the last 5 years there have 36 37 money spots and only 4 of those winners have won on their 2nd or 3rd entry. And of the seven winners last year (top 6 + Bonus), all won on their first entry. So you’re gut instinct is usually the one with the best chance. Edit – it’s 37 money spots because we also had a tie for the Bonus in 2015 (I already accounted for the tie for 6th in 2012). We fell short of last year’s record (161) but we have at least 149 entries which is our 2nd highest total ever. I’ll start posting mini-updates during the day through twitter (#hwciNCAA). With two 9 seeds winning for the first time in a while and two 12 seeds advancing after last year’s 0-fer, I’ll be posting standings highlights in groups of four. 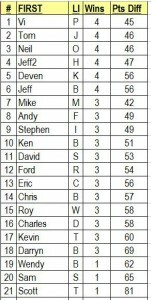 At the end of each night (sometimes after midnight), the standings will be updated by Dave. #16aS-North Florida started off strong but eventually, like in their conference final, #16bS-Robert Morris chipped away and pulled off a 4-point win, 81-77. 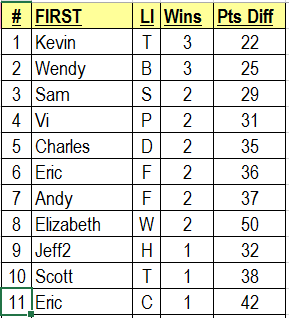 That meant Wendy B and Kevin T were tied at 2-1 with Kevin holding a 2-point lead in the point differential tiebreaker (18 to 20). Home-team-wearing-road-uniforms #11Eb-Dayton took the lead, trailed late, and eventually came back to pull off a 1-point win, 56-55, thanks to a no-call-that-is-usually-called on a buzzer-beating 3-point attempt by #11Ea-Boise St. That margin gave Kevin T the HWCI NCAA First Four for Charity title, holding off Wendy B by 3 points (3-1, 22 to 25 differential). The Flyers win also meant Scott T (10th) and Eric C (last) didn’t go 0-4. Elizabeth W, despite being 50 points off in her picks, finished 8th. 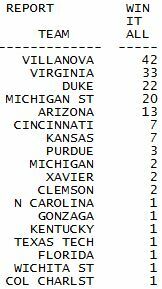 North Florida will be a footnote in our pool as only teams who make the 64 are counted in our pool. So only 4 new teams made it. So thanks for playing but we’re not done yet. In addition to the $22 (11 x $2) I will be donating based on the entries to the Dr. Susan Love Research Foundation, I should be getting at least $15 from other generous people, and, since we look like we’re passing 138 entries (see below), I’ll be chipping in another $25. So at least $62. 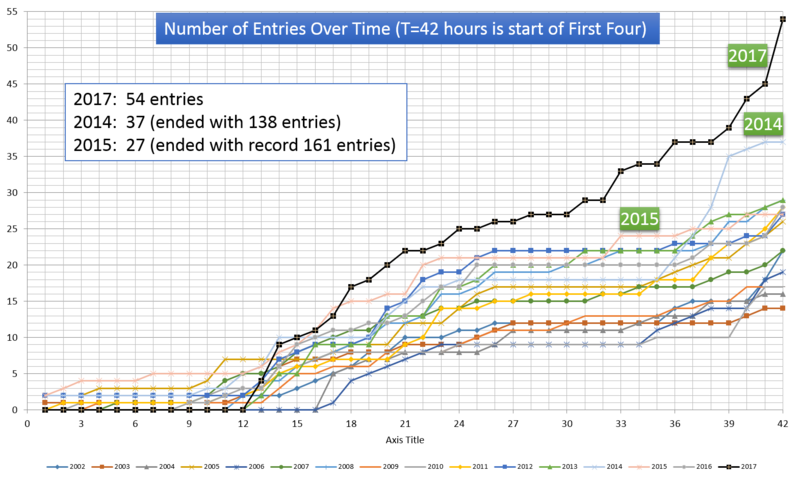 As of 2:15 am, we have 133 entries (from 91 people, 18 who are brand new! ), well on our way of breaking the 138 we had last year (I still have 2 entries and we have 2 mail-in entries (yes, mail-in!)). We had a record-breaking 72 entries on Wednesday, shattering the old record of 63 in 2013 and ended with 123 which blitzed by the old record of 110 set last year. We have also set a record of 32 people entering more than one entry (we had 26 in 2012 and 25 last year) which may reflect the balancing point of picking Kentucky and not picking Kentucky. EL SEGUNDO, CA (smt)- Some good Tuesday games as under #16bMW-Hampton won their 5th game in a row to reach .500 (17-17) and the right to lose to #1MW-Kentucky while #11aW-Ole Miss rallied from a 17-point halftime deficit to beat #11bW-BYU in a high-scoring affair, 94-90. In 2012, BYU had rallied from a 25-point deficit in a First Four game. As #16aS-North Florida leads by six at the half and tries to make the Round of 64 proper for the first time, a rare home game will see host #11bE-Dayton battle #11aE-Boise St. After the First Four is done with, it will no longer be considered the 1st Round, thus confusing as Thursday starts the 2nd Round. We will revert back to the 1st Round being the Round of 64 games and the 2nd Round being the Round of 32 games next year. Small victory. Haven’t really seen any Kentucky backlash (as in the world is now not picking the Wildcats to win it all) yet. So this is interesting. We got a record 42 entries on Tuesday, shattering the previous record of 25 (2011). Maybe the java issues prompted people to enter earlier than usual. We now have 60 entries, which considering we typically get just 30% of our final total by this time, that would mean we’d have 200 entries. We won’t get close to that, but we have a pretty good shot of surpassing 2012’s record total of 134. So keep spreading the word. Well, my business review is over and it went well. Drove almost two hours from Pax River in Maryland back to Tyson’s Corner in Virginia. Got a very good filet, crab bisque, and very fresh scallops (and I don’t care for scallops). Then walked about 5 miles in DC in sub-freezing weather. So now, playing catch-up with the pool. First of all, sorry to everyone if you’re an Apple fanboy/girl and couldn’t load the java applet to see the bracket but thanks to you for being flexible and taking pictures with your smartphone (yes, even iPhones) and sending it to us. I think I’ve finally entered the last of them delaying David in posting the standings. If it’s not up soon, then check tomorrow morning. Wow, they were right about ND playing themselves up to a 6 seed which is probably too high… unfortunately, both of my brckets had ND :-(. And OT for Florida-BYU! Unofficially, we have 118 entries, which tops last year. Still working out final details and hope to have some info up later today.